Edinburg is centrally located in Walsh County, governed by home-rule charter, and has a population of 200-225 people with well-kept homes and attractive yards. The city park was established in 1910 by the Civic League. It covers an entire block along the highway and is beautifully groomed with attractive trees, shrubs, and flowerbeds. A museum, bandstand, and ample playground equipment make for ideal family gatherings, picnics, and celebrations. Edinburg Fire Department is one of the best in the area with equipment including one big pumper, a 4-wheel drive pick-up with pumper, a 2500 gallon tanker truck with a turrent and another tanker truck with 1500 gallon capacity. The department stems from the Edinburg Fire Company which was organized in 1909 and has grown in membership, territory and especially in up-to-date fire-fighting equipment. In the mid 1800's ox carts laden with furs traveled along the west edge of Edinburg on their way from Winnipeg to St. Paul when it became necessary to avoid the muddy trails near the Red River. Today large semi-trucks and railroad cars transport potatoes, cattle, wheat, and other grains grown in abundance by the farmers in our mainly agricultural area. Edinburg is a GREAT place to live. We would like to welcome you with new streetlights, banners, and well-kept business fronts when you "cruise" into Edinburg from north or south on ND Highway #32. Our hanging flower baskets were beautiful this past summer along with the planters on the Main Street sidewalks. 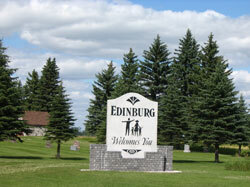 Come visit us soon - we love to have people come to Edinburg! A great ad for what I presume was Cordelia's store when I was growing up. The milder weather these last few days has put a smile on many a face in the community. The streets are cleared of snow so I few hardy souls are out in the mid-day sun taking a walk. I think I will wait until it warms up a bit more. Tomorrow, March 29th the high school will be having an ative shooter training exercise with the HS staff and adult volunteers. There will be police, ambulance, and fire vehicles around. People should not be alarmed as this is a training exercise. Don't forget you can still order fresh bread to order down at the store. It is so good. Cindy does a great job as manager. There were many people in attendance at the bridal shower for Morgan Ellingson last Satturday. Edinburg Quick Response Unit was organized in 1980 and works hand-in-hand with the town's fire department. Its modern unit includes an automatic defibrillator, oxygen tanks, backboards, suction units, trauma kits, and other equipment to make it a very efficient life-saving unit. Front row: Left to right Christine Ohma, Abbie Sondeland, Suzy Kartes, Jessica Ellingson. Back row: Randy Johansen, TJ Hall, Pete Thingelstad, Chuck Kartes. Not pictured: Penny Nygard, Kayla O'Toole, Jackalyn McCollum, Morgan Ellingson.